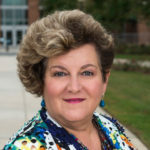 Faye Taxman, University Professor of Criminology, Law and Society at George Mason University, is an expert in health services and correctional programs, probation and parole supervision, and organizational change models. Taxman is the Director of the Center for Advancing Correctional Excellence at George Mason and consults with the Maryland Department of Public Safety and Correctional Services. She is a fellow of the Academy of Experimental Criminology and a member of the Correctional Services Accreditation Panel of England. Taxman has received awards and honors from organizations including the American Probation and Parole Association, the American Society of Criminology and the Association for Medical Education and Research in Substance Abuse. She has published more than 155 articles and co-authored, American Exceptionalism in Crime and Punishment and Implementing Evidence-Based Community Corrections and Addiction Treatment. Taxman received her Ph.D. and M.A. in Criminal Justice from Rutgers University and B.A. in Political Science and Criminal Justice from the University of Tulsa.